Over the next few years, FSPW will be helping the US Forest Service restore whitebark pine populations in the upper reaches of the Scotchman Peaks landscape. The whitebark pine initiative falls under the umbrella of the Lightning Creek Treasured Landscape project, which the Friends of Scotchman Peaks have helped with in many different ways over the past few years. The Treasured Landscapes campaign, which is mostly funded by the National Forest Foundation, has allowed the Forest Service to learn more about the vegetation in the area, which had often been trumped by recreational initiatives in the past. 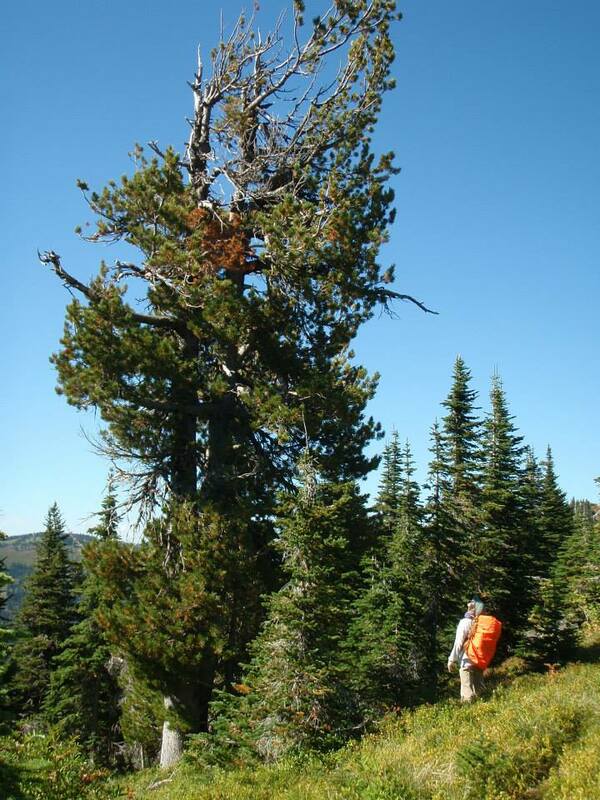 In 2013, the Friends of Scotchman Peaks helped conduct surveys to identify remaining populations of the whitebark pine on Scotchman’s Peak. The whitebark pine is a five-needled, stone-seed pine. It is a dominant or co-dominant species in sub-alpine forest stands, especially on southern aspects. Whitebark pines are remarkably tolerant to both drought and cold, and its seeds are disseminated by seed hoarders (small bird, squirrels, etc.). However, the whitebark pine is highly susceptible to white pine blister rust, a non-native, invasive fungal pathogen. Mature whitebark pines are also very attractive to mountain pine beetles, especially when stressed by things like blister rust or fire. During the Scotchman Peak Fire of 2015, many old-age whitebark pine south of Scotchman Peak were killed, and still others were damaged in areas where the fire burned less severely. The impacted trees occur within an area proposed for cone collection and restoration efforts as part of the Treasured Landscapes – Whitebark Pine and Prescribed Burning project. However, now the trees that initially survived the fire are stressed, making them highly enticing and susceptible to lethal mountain pine beetle attacks. FSPW volunteer Kate Walker applies verbenone to a whitebark pine tree. Application of a mountain pine beetle anti-aggregate pheromone (verbenone) that took place in June 2016, may help to save some of the fire-impacted trees. 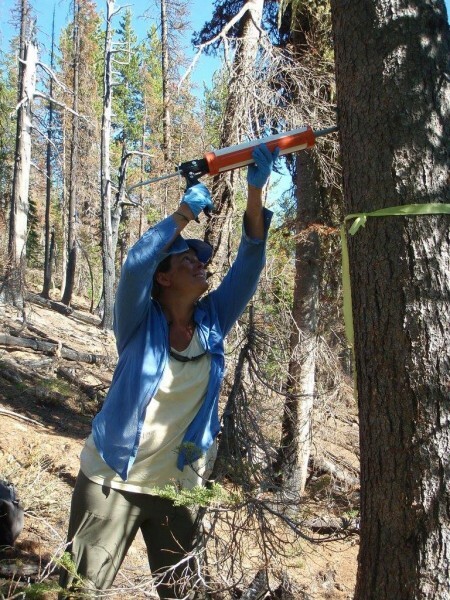 Because the area is within recommended wilderness, the Forest Service and FSPW volunteers utilized SPLAT (Specialized Pheromone & Lure Application Technology), a special device that looks like a caulking gun and administers a specific amount of verbenone with each trigger squeeze. In late June, early July 2017, Forest Service staff and FSPW volunteers will be spending 4-days and 3-nights on Scotchman Peak to sow whitebark pine seeds in hopes of growing the whitebark pine population in the area. The group will be sowing approximately 1 pound of seeds over the 4 days and camping out on the mountain at night. If you would like more information on the project or are interested in participating in the direct sowing portion of the project, email Britta at britta@scotchmanpeaks.org.